Super Moon & Lunar Eclipse Together! In the US, Canada, and Central and South America, this rare Total Lunar Eclipse of a Supermoon will begin on the evening of September 27, 2015. In Europe, South/East Asia, Africa, the Arctic, and in the Pacific, Atlantic, and Indian Oceans it starts after midnight on September 28, 2015. Also called a Blood Moon this eclipse will last for about 1 hour and 12 minutes. NEW: See pictures of this eclipse! Taking pictures? Share them with us! Eclipse is in progress, click "Live" in the animation below to see what it looks like now. News About the Moon this Month! English is on the last half of this page! A verdadeira Super Lua acontece no fim de setembro, e algo raro chamará a atenção nesse dia! 31/08/15 - No dia 27 de setembro de 2015, além da Super Lua, teremos um Eclipse Lunar Total! Muitos observadores chamaram a Lua Cheia do final de agosto de Super Lua, isso porque foram menos de 24 horas que separaram o momento em que ela ficou 100% iluminada (cheia) e o momento do perigeu (máxima aproximação com a Terra). E se essa Lua Cheia já chamou a atenção de muita gente, no dia 27 de setembro de 2015 será ainda melhor! Mas por que? A Lua Cheia de 27 de setembro estará a menos de uma hora da máxima aproximação da Lua com a Terra, portanto, ela parecerá ainda maior no céu noturno, e pra fechar com chave de ouro, nessa mesma noite teremos um Eclipse Lunar Total! Serão dois grandes eventos astronômicos numa única noite! Além do mais, pra tudo ficar ainda melhor, esse Eclipse Lunar Total do dia 27 de setembro de 2015 será visível em grande parte do mundo, inclusive em todo Brasil! não poderão observar esse eclipse. Na internet encontramos informações de que esse Eclipse Lunar acontecerá no dia 28 de setembro, mas isso por que de acordo com o horário internacional (UTC) já será dia 28 de setembro. Mas não se engane, pois no Brasil será dia 27 de setembro. Também conhecida como Lua de Sangue, esse Eclipse Lunar será o último da tétrade atual. O primeiro Eclipse da Tétrade aconteceu no dia 15 de abril de 2014; o segundo no dia 8 de outubro de 2014; o terceiro no dia 4 de abril de 2015, e o último será agora, no dia 27 de setembro de 2015. E se o tempo não ajudar, não se preocupe, pois teremos uma transmissão ao vivo aqui em nosso site! Para não perder o evento, basta confirmar sua presença clicando aqui, assim você será notificado(a) quando ele estiver próximo! O que é a Tétrade de Eclipses Lunares? A Tétrade de Eclipses Lunares é uma série de quatro Elipses Lunares Totais que acontecem em uma determinada época. A última Tétrade foi em 2003 e 2004, e só acontecerão mais sete tétrades como essa no século atual. Algo ruim vai acontecer no dia 27 de setembro de 2015? Não. Será apenas mais um Eclipse Lunar Total, um evento que sempre ocorreu e continuará acontecendo em determinadas épocas. No passado remoto, quando a sociedade não tinha um bom entendimento dos eventos celestes, os Eclipses eram vistos como presságio de desastres, assim como os cometas. Além disso, um livro publicado 2013 por John Hagee, intitulado "As Quatro Luas de Sangue: Algo está prestes a mudar", fez com que superstições como essa ganhassem ainda mais força. Eclipse Solar Jupiteriano: Telescópio Hubble registra momento épico! Então, se a Super Lua de agosto já chamou a sua atenção, prepare-se para a Super Lua com Eclipse Lunar Total do dia 27 de setembro, pois será um verdadeiro espetáculo! A total eclipse of the Moon occurs on Monday 28 September, 2015 UT, lasting from 00:11–05:22 UT. The Moon will be plunged into darkness for 1 hour and 12 minutes, in a deep total eclipse which will see the Moon 28% of its diameter inside the Earth's umbral shadow. The visual effect of this depends on the state of the Earth's atmosphere, but the Moon may be stained a deep red colour for observers from the Americas, Europe and Africa. The partial eclipse will last for 3 hours and 20 minutes in total. During this eclipse the Moon will be at perigee, making it extremely large. At maximum eclipse it will be 0.568° in apparent diameter, which is 6.9% larger than average. The statistics page has information on the ranges of the sizes of the Sun and Moon. Most of Alaska will miss the total eclipse, as it will be over before the Moon rises during the final partial ecllipse. However, eastern parts of the state, along with the Yukon and western British Columbia, will see the Moon rise in total eclipse. 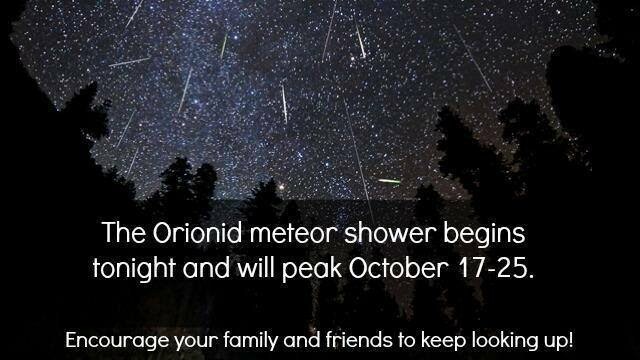 A clear view to the eastern horizon, where the Moon will be rising, will be essential to enjoy this event. Farther east again, through British Columbia and Alberta, Idaho, Utah, and Arizona, the Moon will rise during the opening partial eclipse; the entire total eclipse will then be visible. In San Francisco, for example, the Moon will rise at 01:56 UT, 49 minutes after the partial eclipse begins; with the total eclipse starting at 02:11 UT, the Moon will be very low on the eastern horizon during totality. Again, a clear view in that direction will be essential. 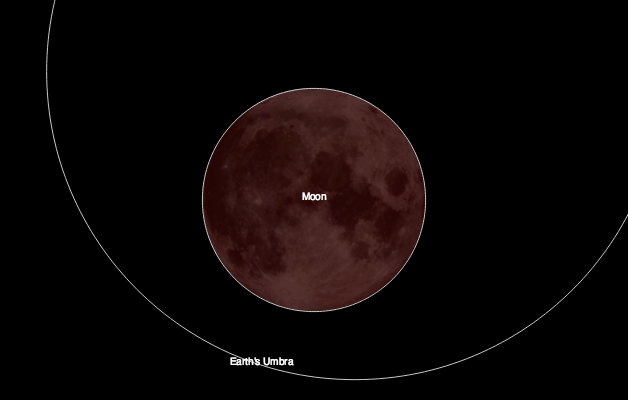 Farther east, throughout the rest of the US and Canada, and the whole of South America, the whole lunar eclipse will be visible. The full eclipse is visible through western Europe and the western half of Africa; the Moon will be moving towards the western horizon, and getting close to setting, so check the eclipse times in your local time. The closer to Moonset (which is also Sunrise), the closer the Moon will be to the horizon. In western Russia, Finland, Belarus, Ukraine, Turkey, Egypt, and a strip of central Africa down to Mozambique and South Africa, the moon will set during the final partial eclipse. The whole total eclipse will be visible, but with the Moon close to setting, a clear view to the west will be needed to enjoy it. In Cairo, for example, the Moon will set at 03:52 UT, just 29 minutes after the total eclipse ends. Farther east, through central Russia to Iraq/Iran, Somalia and Madagascar, the Moon will set during the total eclipse; farther east again, through Kazakhstan, Uzbekistan, Turkmenistan, Afghanistan, and Pakistan, the Moon will set during the initial partial eclipse, making a relatively uninteresting sight. This map shows the visibility of the eclipse at various stages. The bright area in the middle will see the whole eclipse; the coloured bands to the right will see the start of the eclipse, and those on the left will see the end. Note that the map is approximate, and if you are near the edge of the area of visibility, the moon will be very close to the horizon and may not be practically visible. You can use the zoom controls to zoom in and out, and pan to see areas of interest. Hover your mouse over the tags to see what will be visible from each area on the map. The green marker in the centre shows where the Moon will be directly overhead at maximum eclipse. Here we go with the International Year of Light! 2015. Lots of projects. Lots of people moving forward with Science and Astronomy. Help us celebrate Light!! Please join the Enterprise in Space team by contributing to this project! I find this to be a very interesting project. The iCollaboratory Team is pleased to announce that Enterprise in Space Academy (EISA) is developing science/astronomy projects for students in the iCollaboratory. All teachers and students from EISA will become regular iCollaboratory members. The leader of EISA is Lynne Zielinski, retired science teacher from Glenbrook High School and an iCollaboratory project member since its inception. To learn more about EIS please visit their web site at http://enterpriseinspace.org. This 116-megapixel mosaic of the moon was captured by David Campbell, and was one of the Royal Observatory’s 2012 Space Photographer of the Year Finalists.